The Womble MPEG Video Wizard DVD version is strictly an MPEG editor with DVD authoring and full Dolby (AC-3) encoder support. It was originally developed in the early days of MPEG2 editing hitting the mainstream especially when video camcorders were moving away from dv.avi files and into the new MPEG2 format. 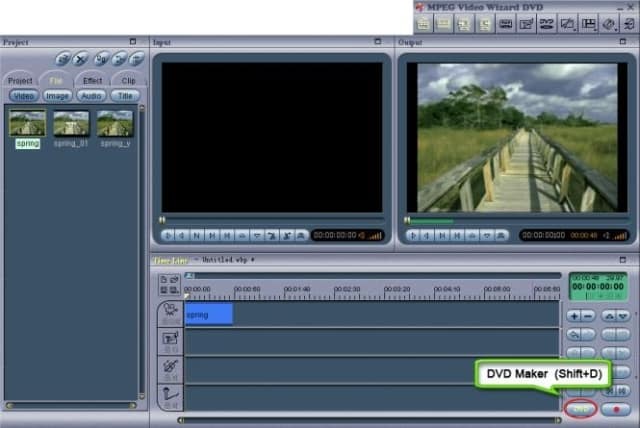 At that time editing MPEG2 files or any of the newer highly compressed files was quite difficult and presented a whole new range of problems to the home video editor. Of course these days we are using MP4 files predominantly and just about all video editing software can handle these as well as MPEG2’s with ease. Womble has not been particularly well developed as an editor since those early days and now looks a bit clunky from a strictly editing point of view. The reason I still have it on the site is because today I would not consider it as a choice of video editor but the remaining value of the software is in its repair and correction tools. If you are looking for tools to repiar or correct MPEG2s, MP4s or DVD files then read on. DVD Camcorder owners, Personal or Digital Video Recorder (DVRs/PVRs) owners, anyone wanting to edit HDV files, anyone wanting to edit MPEG2 or MPEG4 (mp4, .avi, .Mov. H.264 etc), anyone wanting to convert MPEG to mp4, in fact just about anyone who deals with these files a lot. It is not for anyone who has a great demand for lots of special effects capabilities and video wizz-bangery (I made that word up). It is quite basic in it’s features compared to other video editing software but having said that, it is very capable at doing what it does do. It is also not for anyone that deals with video files in a wide range of video formats or has a need to output their projects to a wide range of video formats. Why a specialist MPEG2 Video Editor or MPEG4 Video Editor? Boy, that’s a long story I have told before and I really lack the energy to type it out again! The basic reason is that MPEG editing or DVD editing has it’s own set of unique characteristics that make them problematic. If you really want to know all the nitty gritty about those difficulties then take a look here at a blog entry I did that at least attempts to explain the problems with MPEG2 editing and MPEG4 (mp4) editing. In the early days of editing MPEG2 video files and DVD files Womble was the first movie editing software to really nail down the process of doing MPEG editing accurately and stably. The rest took years to catch up. As it is today Womble MPEG Video Wizard still stands head and shoulders above the the pack in dealing with these difficult and highly compressed video formats that were never designed with editing in mind. Ok let’s be honest here, Womble MPEG Video Wizard started off life as an MPEG editor created by computer geeks for computer geeks! The interface has come along way since then and although presented very nicely it is by no means the most intuitive you will ever see! The menu bar you see top right actually floats on the desktop by itself independent of the other visible parts so you can move it to where you want. Not a bad idea except occasionally you forget where you put it only to find it underneath the currently opened window…a bit annoying. Apart from the “hide and seek” menu everything else is laid out in a pretty straightforward manner offering easy access to features once you get to know it a little better and each module can be customized to suit your needs. The bottom line here is that any video editing software you choose will have it’s own little interface quirks that you have to get to know and Womble is no different. It does come with a very complete .pdf help file that should get you up to pace quickly provided you read it! Frame accurate editing so that you can make precise cuts at the exact point where you want rather than where the software is capable of cutting. You can step through the video frame by frame. Womble has easily the fastest scrubbing (that means moving quickly from one point in the video to another) of any MPEG editor on the market except perhaps for the very high end video editors. You can quickly find the scenes in your project that you want to keep, cut or apply effects. No re-encoding when editing DVD-compliant MPEG captures from the latest USB/DVD capture boxes. When using these sources to create a movie for DVD burning, you don’t have to wait for hours while your movie is re-encoded into something the MPEG editor can handle. Instead, your edited video will be written back to disc as fast as any disc-to-disc copy operation. Womble has full Dolby (AC-3) audio encoder support and DVD authoring with simple DVD menu creation. There is a reasonably good title editor for both text and graphics generation and multiple editing windows, with flexible window configuration and layout. Bookmarks are special frames used to index a movie. These reference points are especially helpful in editing a lengthy movie. Aside from being a convenient reference point, each bookmark also represents a clip, from the bookmarked frame to the next bookmark or the end of the video file. It is often necessary to align clips to a specific time point, such as to a marker, to an edge of another clip on a different track, or to the edit line. This particular move operation is called a “snap”. Lock an entire track to prevent accidental changes to the clips on it, while working on other tracks. An extensive transition library with simple controls. Most common transitions can be added using only the mouse to drag and drop. There are about 40 2D transitions and 20 3D transitions which is way, way more than enough. Transitions can be dragged and dropped into the timeline and length adjusted by selecting and dragging handles that appear at the end of the transition. There is an additional dialogue box for the control of each transition’s properties. Additionally Womble lets you to select your preference as to what to do with the audio part of the clip that has had a transition applied. There is a feature for saving presets of the transitions you use often so you don’t have to keep repeating the action of customizing a particular transition. Womble has a more than adequate offering of video filters including the usual Color Balance, Hue and Saturation, De-noising, Crop, Flip, Rotate and more. Filters can be easily applied to an individual clip or image file by simply dragging and dropping them on to the clip or image in the timeline. Each filter has it’s own properties box in which you can adjust the individual properties of the filter being applied. From all of that I think you should be able to see that Womble MPEG Video Wizard is a good all round video editing software in itself. Hardly the stuff to set the world on fire but all very usable and what it does do it does very well. All of these points are not why anyone would purchase this piece of video editing software… you could get any of that with just about any other comparable product and probably a whole lot more. The real reason Womble MPEG Video Wizard DVD stands out is that it does all of those things exceptionally well on highly compressed MPEG2 and MPEG4 (mp4) video files. Additionally it does all of that on the widest range of MPEG video file properties available today including high definition MPEG video files as well as non-standard MPEG video files that come from high definition TV (HDTV) capture and a host of others. If your video editing needs fall into this category then Womble MPEG Video Wizard DVD is well worth taking a look at. The best thing to do is to download the software for yourself and put it through its paces based on your needs. You can download a free trial copy by clicking here at.